PN: HUSMM8080ASS200. Formatted to 512 to work in Dell / HP / Supermicro / Generic servers. Boardroom Technologies will provide top level service and will do everything in our power to satisfy all your needs. Hitachi Ultrastar 7K4000 HUS724040ALS641. Size - 4TB 3.5". Interface - SAS (Serial Attached SCSI). Working Pull. Model: HUS724030ALS641 P/N: 0B26926. 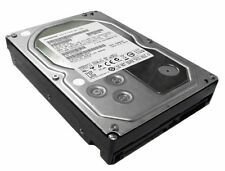 1x HGST 3TB 7200RPM 3.5" SAS HDD Drive HUS724030ALS641. 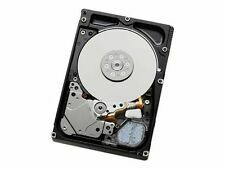 3TB Hitachi HGST 7200RPM 3.5" SAS Hard Drive. Drive was pull from a storage array system. It's been used as a storage drive from a NAS server. Interface- SATA 6Gb/s. Interfaces- 1 x SATA 6 Gb/s - 7 pin Serial ATA. MTBF- 2000000 hour(s). Weight- 1.52 lbs. Start / Stop Cycles- 600,000. Non-Recoverable Errors- 1 per 10^15. Slot Required Type- none. THIS HAS A SAS INTERFACE! You cannot use a SAS TO SATA adapter to make it work. These drives are used in NASs and Servers only. Used drive pulled from working system. Apple HGST HTS541010A9E662 1TB . Condition OEM-Like-New. ~39 hours of total use. Device pulled out of mac mini once bought and replaced with SSD. Device has been wiped and validated with CrystalDiskinfo. Shipped with USPS First Class Package. WIPED/CLEANED Factory reset Hard drive. B : Mostly looks clean but you may notice visible scratches or minor wear on certain area(spot) fyi:(Most of computer components like CPU, RAM or motherboard belong to this grade). 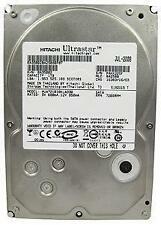 You are Buying 1-Hitachi Ultrastar 0F10402 1TB HUA721010KLA330. Tested for Key Functions-R2 Ready for Resale. Hours of operation: M-F 8:00AM-4:30PM. 1260 E Watertower St. pcidaho1 - pcidaho2 - pcidaho3. Model #: HMS361006M5CE00. P/N: 0A40728. Interface: ZIF PATA. For Sale: LOT OF 5 Hitachi, 5GB, 1" MICRODRIVES. Trending at $36.12eBay determines this price through a machine learned model of the product's sale prices within the last 90 days. 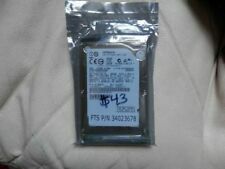 New ListingLot of (7) 160GB mix MFG SATA laptop HDD's (Hitachi, Seagate, WD,etc.) - tested! You are purchasing one lot of (7) mix MFG 160GB SATA laptop 2.5" HDD's. One each are made by WD, Samsung, Toshiba, Seagate and three are Hitachi. The proceeds of this sale go to help support this 501-C3 non-profit. Hitachi 900GB 10K 2.5" SAS Hard Drive Dell Server R710 R720 R730 R610 R620 R630 With Tray. For Models: Dell R710 R720 R730 R510 R610 R620 R630 R410 R310 T710 Servers and many more. 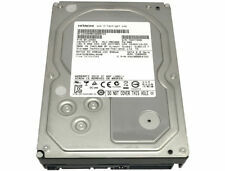 Hitachi 900GB 10K 2.5" 6Gb/s SAS Hard Drive With Tray. HUS724040ALE640 (0F14683). Ultrastar 7K4000. Massive space - Up to 4TB for capacity-optimized enterprise applications. Height (maximum). Form Factor. Security: Optional Bulk Data Encryption (SATA). Maxiumum efficiency - 24% lower W/GB than predecessor. 171 MB/s sustained transfer rate, Sector size (bytes): 512e, Max. areal density (Gbits/sq. in): 446 (512e). We will not be able to change this after checkout has been completed. What's Included. Trending at $44.50eBay determines this price through a machine learned model of the product's sale prices within the last 90 days. PN: HUC156060CSS204. 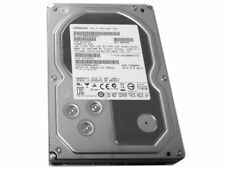 Hitachi 600GB 15K 2.5" 12Gb/s SAS Hard Drive. Boardroom Technologies will provide top level service and will do everything in our power to satisfy all your needs. NEW IN BOX High Capacity 2TB HDD - HITATCHI. HITATCHI 2TB 7200RPM SATA HDD FOR DESKTOP/PC/COMPUTER/DVR. Manufacturer Hitatchi. They are optimized with SilkStream™ technology to capture data from up to 12 simultaneous HD video streams. The hard drive is in Great Condition. Part Number:HTS542516K9SA00. Form Factor:2.5". For Dell Servers R310 R410 R510 T610 T710 R710 and many more. 600GB 15K SAS Hard Drive 3.5" With Dell Tray. Boardroom Technologies will provide top level service and will do everything in our power to satisfy all your needs. MODEL HDS723020BLA642. MPN HDS723020BLA642. STORAGE CAPACITY 2TB. ROTATION SPEED 7200RPM. CACHE 64MB. INTERFACE SATA III. If you prefer you may also feel free to recycle such materials to any local R2 or e-Stewards certified recycler. Trending at $34.75eBay determines this price through a machine learned model of the product's sale prices within the last 90 days. Tested and working 98% Health. Formatted and ready for reuse. Fast Free Shipping!! 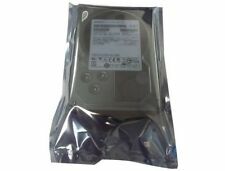 HDD Hard Drive HUA722020ALA330 655-1563B. Model # HUA722020ALA330. 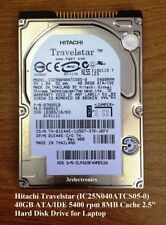 APPLE HITACHI 2TB SATA 7.2K 3.5". Interface SATA. Hard Drives. Part # 655-1563B. Graphics Cards. RAID Cards. Part Number: HUS726060ALA640. Hitachi Ultrastar 6TB SATA 6G 7.2K 64M 3.5" Hard Drive. Storage Capacity: 6TB / 6G / 7.2K. interface sATA. All the logos used are propriety to their respective owners and Technology Traderz does not have any authority over them. Condition is Used. Tested passing. SMART condition is "Good.". HUA723030ALA640 (0F12456). Ultrastar 7K3000. SATA 6.0Gb/s. SATA ULTRA 512N. For Enterprise Storage. Lot of (7) 160GB mix MFG SATA laptop HDD's (Hitachi, Seagate, WD,etc.) - tested! Why Do I Need an Internal Hard Drive? Most of us have a computer of some kind, but how does it work on the inside? One of the key components of a computer is the internal hard drive. What is an Internal Hard Drive? Every computer has an internal hard drive, but what is it? The internal hard drive is where the computer stores all of its memory. You can also call the hard drive the HDD. The storage capacity of a hard drive is determined by how much memory, measured in GB or gigabytes, the drive contains. You can also measure the amount of memory in TB or terabytes. 1 TB is equal to 1000 GB. Hard drives, or HDD, have different connections to your computer. These include the SATA connection or the NAS connection. The better your connection the faster your desktop computer works. Hard drives have internal disks which rotate to work. 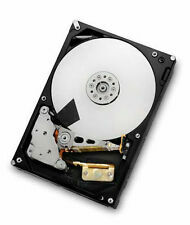 The rotation of the disk determines how fast the hard drive is and is measured in RPM. RPM stands for Rotation Per Minute, so the higher your RPM on the drive is, the faster your desktop computer will be. How Can I Use an Extra Internal Hard Drive? Some people have an extra internal drive, but what is the purpose of having an extra internal drive? You can install the extra drive to expand your memory storage. For the most memory, get a drive that has 1-2 TB. TB is the biggest amount of digital memory we have right now. You can use your extra SATA drive to keep your windows operating system and your computer data separate. Using your extra HDD helps your computer run faster. You can also use your NAS or SATA drive to experiment with different operating systems. One common problem is that Mac users want to use Windows, or Windows users want to use the Mac OS. An extra drive helps you install both. The extra internal hard drive, like a Hitachi Travelstar, can also act as a backup drive so that you will always have backup information if something goes wrong with the original drive. What are the Specs for the Travelstar 7K500? When looking for an internal hard drive, the Hitachi Travelstar 7K500 is one to consider. The Travelstar has 500 GB of internal memory. They have a SATA 3Gb/s interface. The Travelstar is compatible with Windows 7. The form factor, or the size of the drive, is 2.5" x 1/8H. Content provided for informational purposes only. eBay is not affiliated with or endorsed by Hitachi.